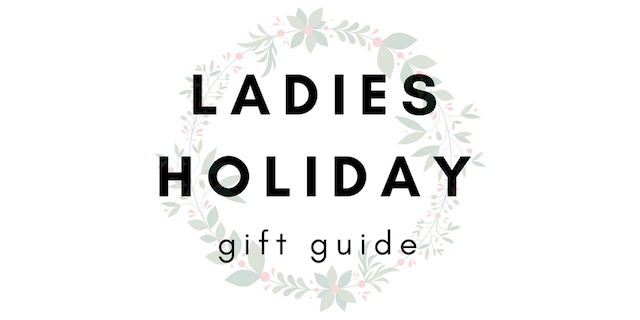 As promised, here is my holiday gift guide! This one is geared toward women, and I tried to choose things I felt like every woman I know would love. I included a variety of price points as well! Let me know your faves! 1. Mac Strobe Cream-- I've been a fan of this stuff for years and now they have a variety of color options! I love the light pink color for reducing the look of dark circles and just adding a pretty blush shimmer. I use it under my foundation as a primer and it makes you GLOW. Whether you prefer minimal makeup of like to do the full glam look, this stuff is awesome for everyone. 2. Ugg Knit Slippers-- who doesn't love a good pair of slippers! These are currently on sale and the quality is AMAZING. The perfect cozy slippers for wearing around your house during these cold months! 3. Mixoo Stylus Pen-- This one may seem random, but it's FOR SURE on my current wishlist. Stylus pens are perfect for writing on your smart phone or tablet... and I'm excited to use one to up my Instagram story game! You can use it like a pen on your touch screen to add pretty handwriting to your posts. This one gets great reviews on Amazon and has a finer tip which is perfect if you're using it on your phone like me. 4. Vince Camuto Booties-- these are gorgeous and amazing. I love a good black bootie & these add a little flare without being over-the-top. They'll go with allll the winter outfits! 5. Free People Sweater-- This seems to be the sweater of the season. It's all over social media and for good reason! This cozy sweater is oversized without making you look bigger than you are. The fit is so good! I'm in love and any woman would be obsessed with this one. 6. T3 Featherweight Hair Dryer-- I'm hoping to find this baby under the tree because it's hailed at the BEST hair dryer. It doesn't weigh a ton & dries your hair super quickly! I'm still working with a hair dryer that takes what feels like hours to dry my hair, so this would be a pretty sweet upgrade. 7. Nike Running Shoes-- These are the LunarEpic Low Flyknit 2's and they are a DREAM. I own a pair of these babies and they are my ride or die gym/running shoes. They are so comfy and hold up really well! I can't recommend them enough! 8. Thread & Supply Pullover-- THIS PULLOVER IS A FREAKIN' DREAM. I snagged one for myself recently in this charcoal color and I can't explain enough how cozy it is! I'm even tempted to snag the ivory or pink as well because it's that good. It's true to size (don't pay attention to the sizing chart that tells you a small fits 00-0... I got a small that fits great & I wear a 6). 9. Beats by Dr. Dre Headphones-- I'm all about the wireless headphones and these ones are SO pretty! So into that matte gold color. They also have a pretty rose gold pair! They get great reviews for their sound quality & are a great gifting option! 10. Tartelette Toasted Eyeshadow Palette-- Tarte always kills it with their eyeshadow palettes! The ratio of matte to shimmer colors is just right and these warm shades are gorgeous! It's their newest palette and quickly becoming a favorite! 11. Spanx Faux Leather Leggings-- These leggings are another item that I'm seeing EVERYWHERE lately. And everyone is saying the same thing- they make your legs look amazing! 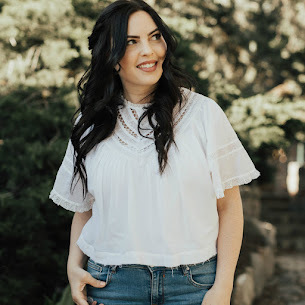 I'm loving these and I'm sure you will too! 12. Arvo Watch-- Arvo watches are beautiful and so on trend. And these new mesh bands they have are so stunning! I love the rose gold & black, but I honestly love all their other watch options too! 13. 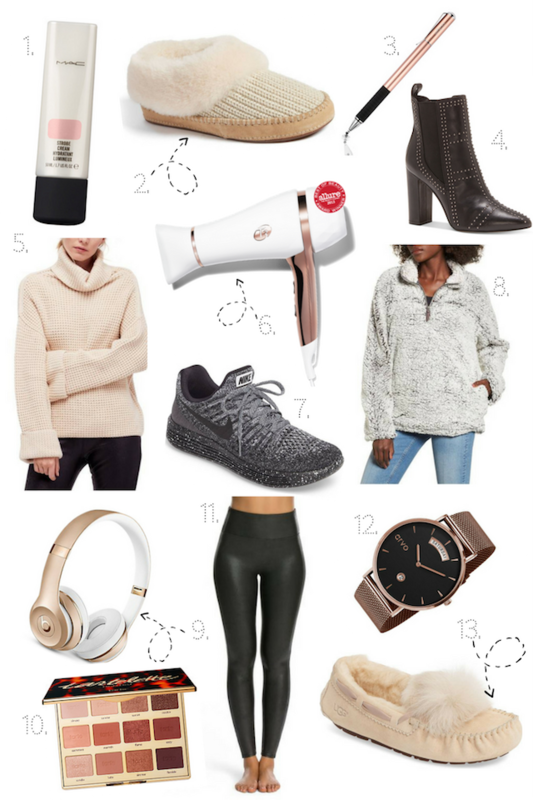 Ugg Pom Pom Slippers-- I know you're wondering why I have two Ugg slippers on this list... and the answer is that slippers are truly the ultimate go-to Christmas gift. And Ugg is just my absolute favorite for coziness! These moccasin style slippers have pom poms on the top and I'm dying with how cute they are!